I’ll admit that I wasn’t really looking forward to this game. I was exhausted. It was Sunday morning. I’d snagged 15 balls the night before (including five of these). I assumed there wasn’t gonna be batting practice, and I didn’t feel like begging all day for toss-ups. I didn’t have a specific goal, and it seemed that no matter what I could possibly accomplish, it would be a letdown. I actually considered skipping the game and sleeping late and doing nothing all day — I’m really good at doing nothing — but then I thought about my return flight to New York. I’d booked it for 8:35pm so that I *could* attend this game. So I went. 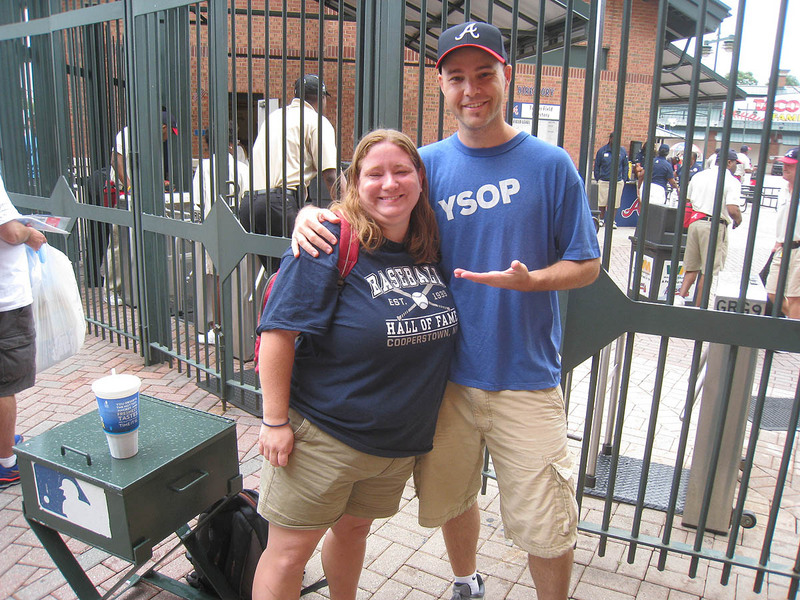 My day at the ballpark got off to a good start when I ran into my friend Katie outside the left-center field gate . . . The batting cage was set up!! There was an awful lot of time to kill, and I had to make a tough choice in deciding how to spend it . . .
Option No. 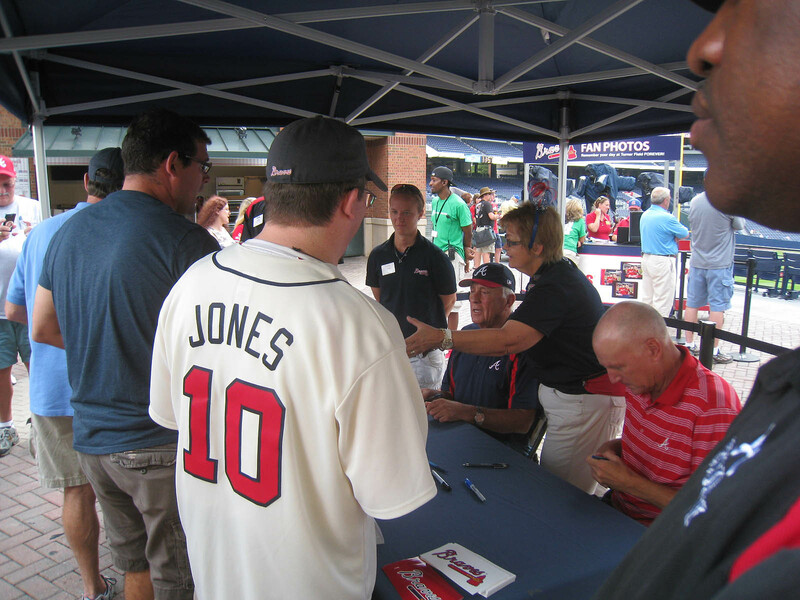 1: Get in line with Katie to get Phil Niekro’s autograph in the Fan Plaza. 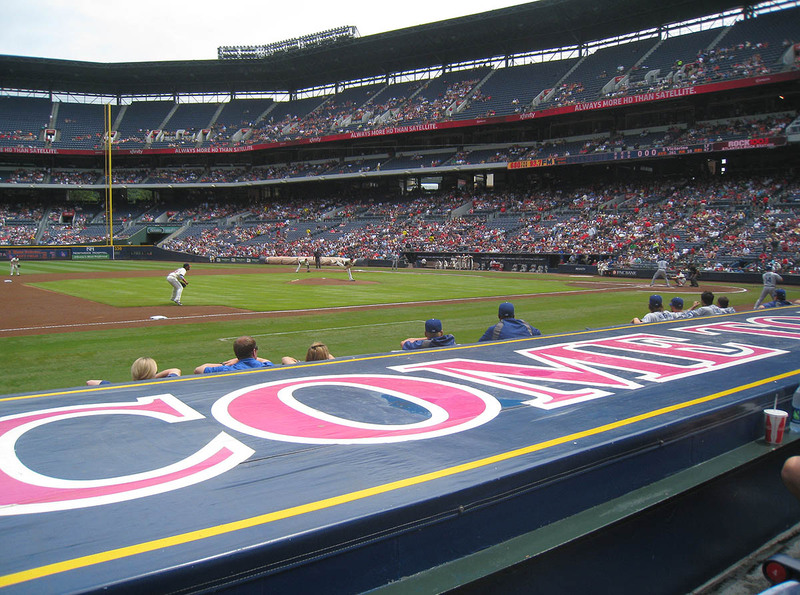 She’d told me that the Braves have a promotion called “Alumni Sundays” during which fans can get free autographs of former players. On this particular day, it was Niekro, but he wasn’t going to start signing until 11:30am — half an hour after the stadium opened. That’s a long time to stand around doing nothing. But Phil Niekro! Option No. 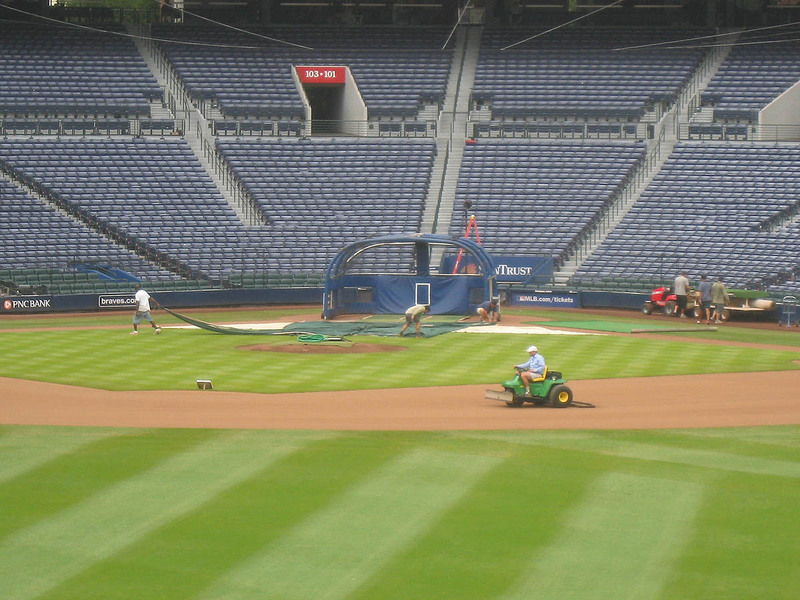 2: Get some food, grab a seat in the shade, watch the groundskeepers set up the field, and be ready in case the Dodgers came out to hit or throw. I went with the second option, in part because I was so hungry that my stomach hurt. (I ate a salted pretzel with a side of processed/artificial cheese sauce. It was wonderful and horrible.) Mainly, though, I didn’t want to miss any opportunities to get baseballs. While I sat and ate, I took photos like this . . .
Batting practice WAS going to happen. It was just a matter of when — and which team. 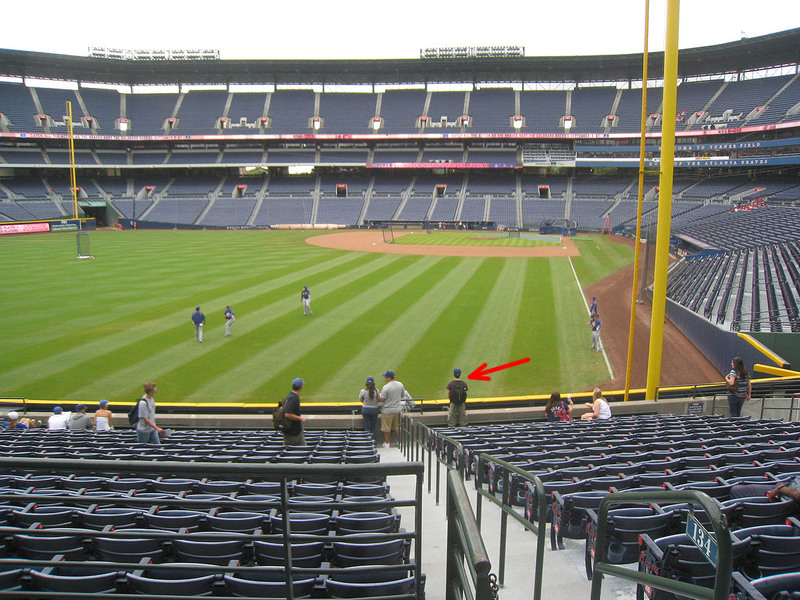 Andrew (pictured above next to the foul pole) flipped me off from afar. “Hey, Shawn, I’m right here,” I said. He then looked in my direction and gave me a nod and tossed it to me. 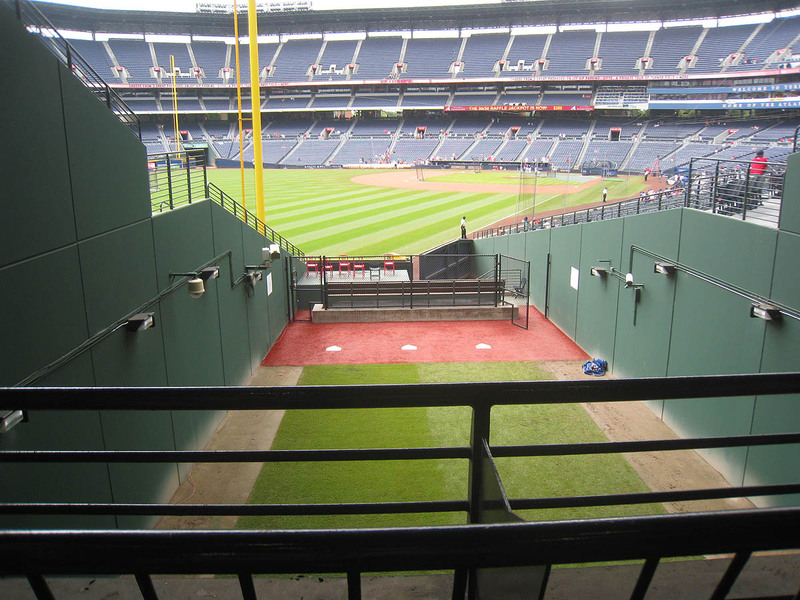 I knew I wasn’t going to get another ball in the same spot, so I moved here . . .
. . . and got one from bullpen coach Ken Howell when all the guys headed back toward the field. The section was dead — very few toss-ups, even fewer home runs, and no glove trick opportunities. All the action was in right-center. That was my 6th ball of the day. After BP, I caught up with my friend Matt, who unfortunately had to witness an unpleasant situation for which I was responsible. Game time was still an hour away, so we decided to head for a seat in the shade . . . far from the field . 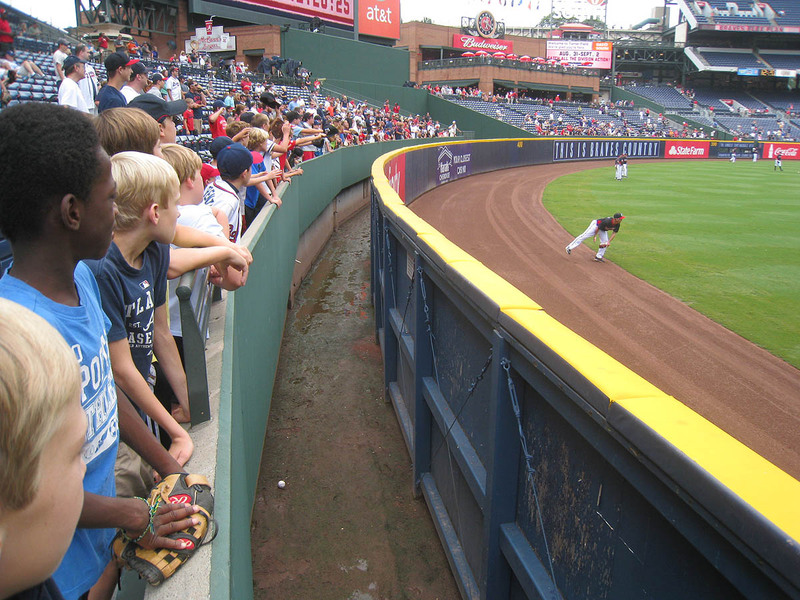 . . under the overhang down the left field foul line. Quite simply, the female usher at the very top of the section denied us. I politely informed her that I had a seat behind the 3rd base dugout and asked if we could sit in the shade for a bit. She responded by saying it was time for us to go to our seats. She was so robotic in her response — she had such a profound lack of compassion and common sense — that it drove me into a mini-fury. I’ll spare you the details. And of course Matt and I were able to find a shady seat elsewhere. 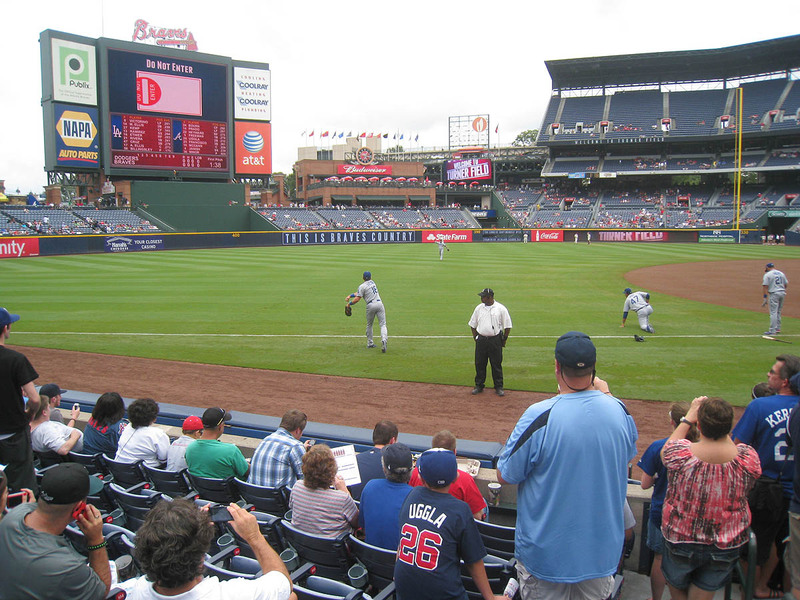 As you can see, two Dodgers were playing catch, and none of the fans were making any effort to get the ball. 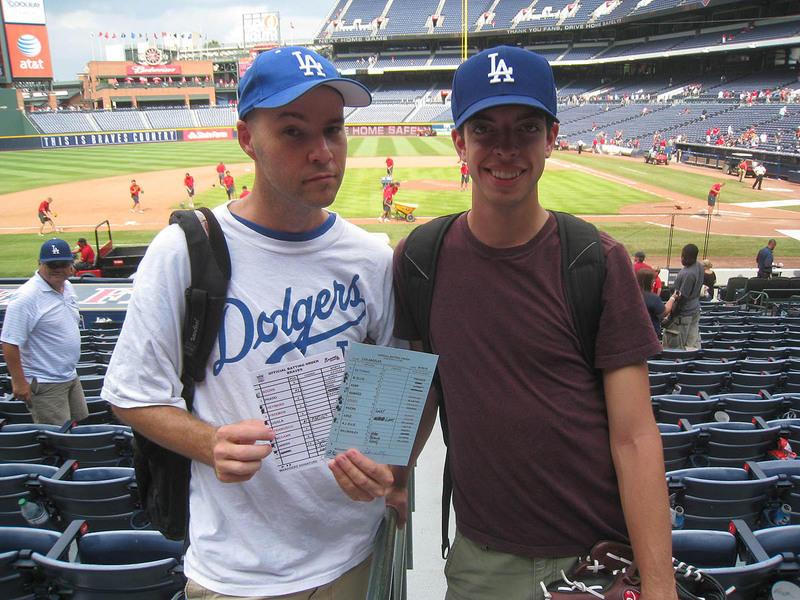 The people wearing Dodgers gear were all waiting for autographs, so I had no trouble getting Matt Treanor (the player on the left in the photo above) to throw me the ball when he finished. I offered the ball to the only kid near me, but he didn’t want it. Then I moved behind the dugout and got another ball — my 8th of the day — from Hanley Ramirez. 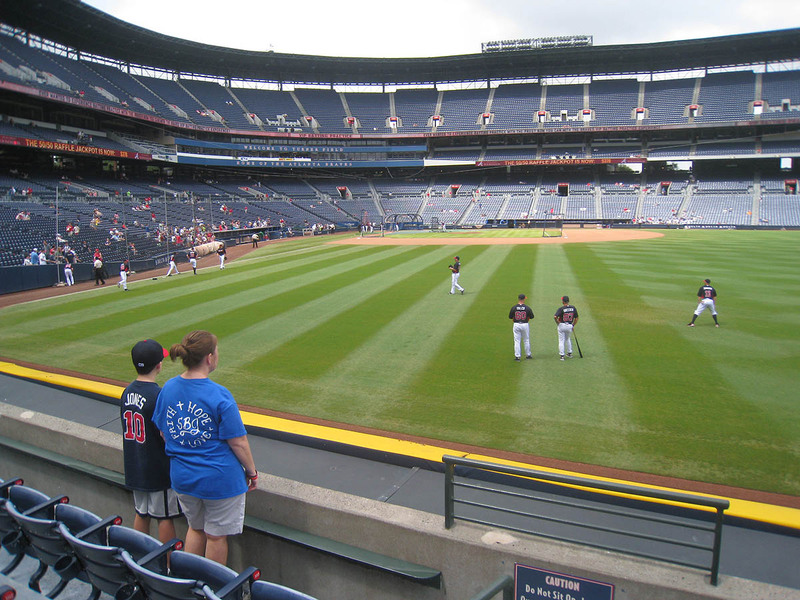 I stayed there for the first few innings, and in the middle of the 4th, I stood up and moved to the front row and planned to ask for the infield warm-up ball. I was semi-disctracted at the time because the “Kiss Cam” was happening. I mean, who doesn’t love the Kiss Cam? Who doesn’t enjoy making fun of all the dopey couples giving each other pathetic/G-rated pecks on the lips? Who doesn’t enjoy seeing people squirm and/or revel in the spotlight? Who doesn’t hope that the jumbotron will show a brother/sister or a father/daughter or two guys or two girls? Anyway, as the inning break came to a close, 1st baseman Juan Rivera threw the ball toward the dugout, Davey Lopes retrieved it from the warning track, and I asked for it. Lopes then disappeared from sight, and that’s when it occurred to me that the song “Mr. Lonely” by Bobby Vinton was playing. At some stadiums, the Kiss Cam will conclude with a shot of a (male) fan sitting alone, usually all the way up in a totally empty section in the upper deck. I was still eyeing the dugout, hoping that Lopes would reappear and give me the ball, but at the same time, I wanted to see who was getting mocked by the Kiss Cam, so I took a quick peek at the jumbotron. “Ha,” I thought, “they’re making fun of some Dodger fan,” and then I looked back at the dugout. Then I was like, “Ohmygod, that’s ME on the jumbotron!” The whole stadium was laughing, and just at that moment, the ball was rolled to me across the dugout roof from someone down below (presumably Lopes). I quickly grabbed it and held it up for the camera — but the shot BARELY got cut off before I had a chance to show it off. This wasn’t how I envisioned making it onto the Kiss Cam, but hey, I’ll take it. It WAS pretty damn funny. And if the Kiss Cam ever DOES show me with my girlfriend, all I can say (to her as well as the viewing audience) is watch out. I’m going to turn kissing into an Olympic event. 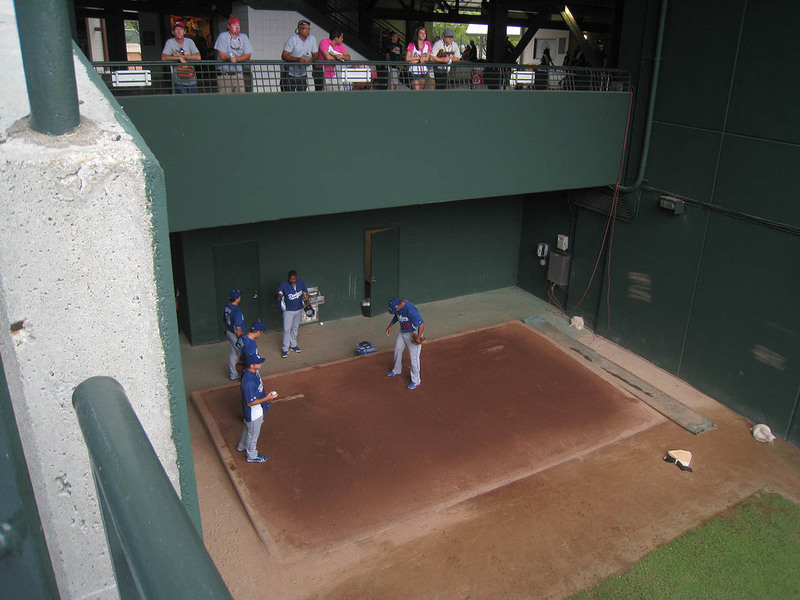 After I got the infield warm-up ball, I moved to the tunnels behind home plate. 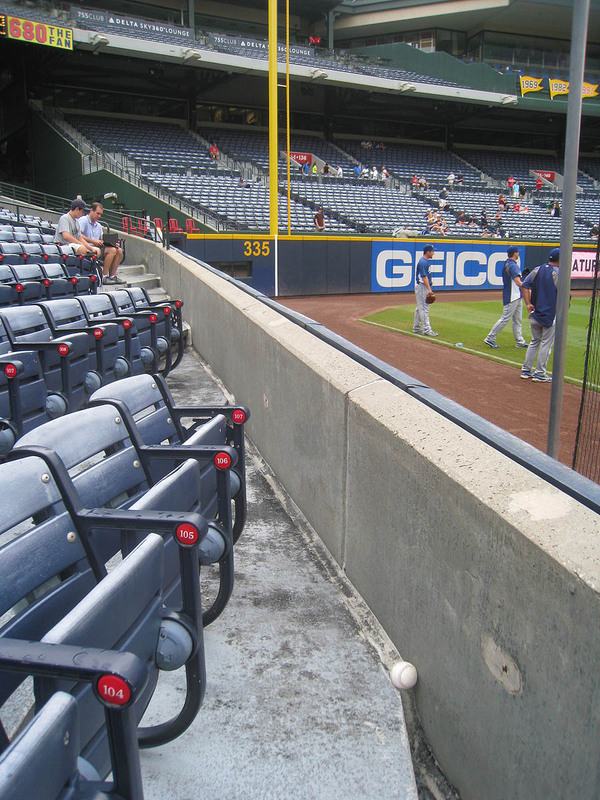 This was my view for all the right-handed batters . . .
. . . and unfortunately, the only time that the aisle was blocked happened to be the exact moment that I had a chance to catch a foul ball. 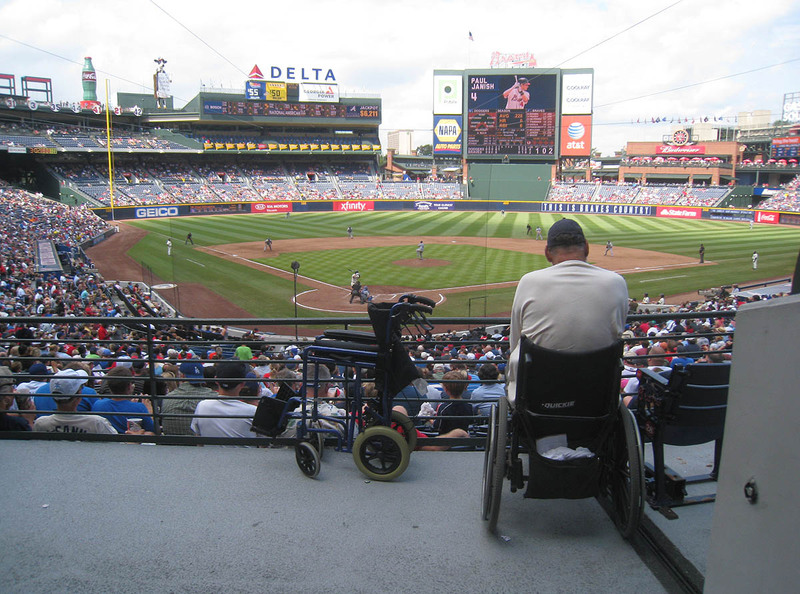 (A 400-pound man, if you must know, was being moved from his seat to a wheelchair, so there was NO getting around him.) 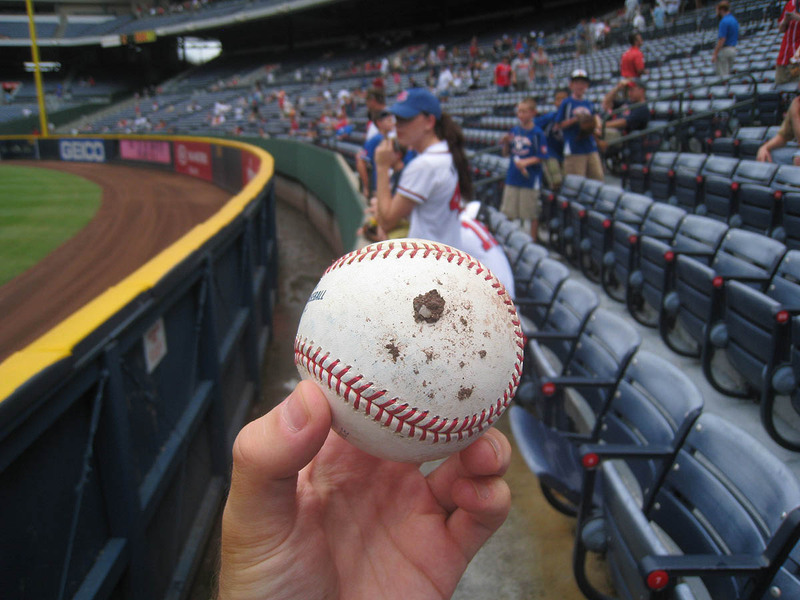 The ball was a high pop-up off the bat of Dan Uggla that landed RIGHT in the middle of the aisle, roughly 20 feet to my left. If it had been hit at ANY other moment during the game, I would’ve been able to drift underneath it and make a very easy catch. It was painful. I’m happy to report that the day ended on a positive note. 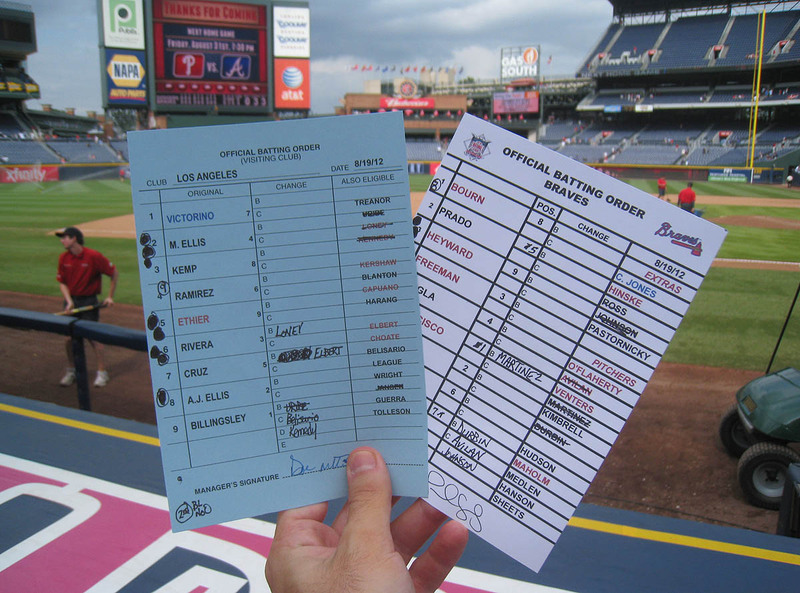 After the Dodgers recorded the final out of their 5-0 victory, I asked the manager for the lineup cards and got them! But it wasn’t Don Mattingly. Mattingly had recently been suspended for two games, so Trey Hillman (who’s normally the team’s “bench coach”) was running the show. 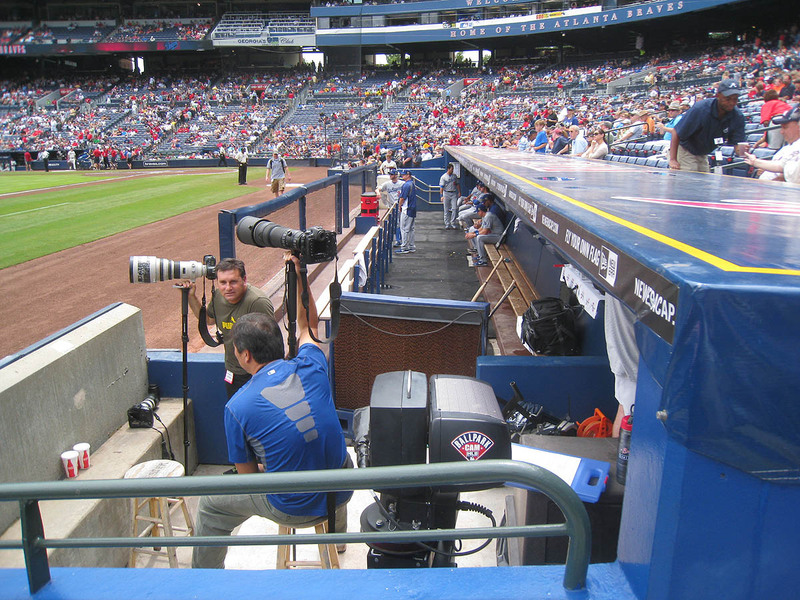 In order to hand me the cards, he climbed up on the edge of the camera well and reached across the dugout roof. Here’s a photo of him that I managed to take at the last second . . .
. . . and here’s a 15-second video of the exchange that Matt filmed. Note Mattingly’s signature on the blue card (partially obscured by my thumb). I guess he was still officially “the manager” even though he wasn’t allowed to be in the dugout? Andrew, for the record, snagged three balls at this game, bringing his lifetime total to 19 — not too shabby for someone who’s barely/kinda getting into it and still doesn’t try THAT hard. • 449 balls in 55 games this season = 8.16 balls per game. I really enjoy your blog. 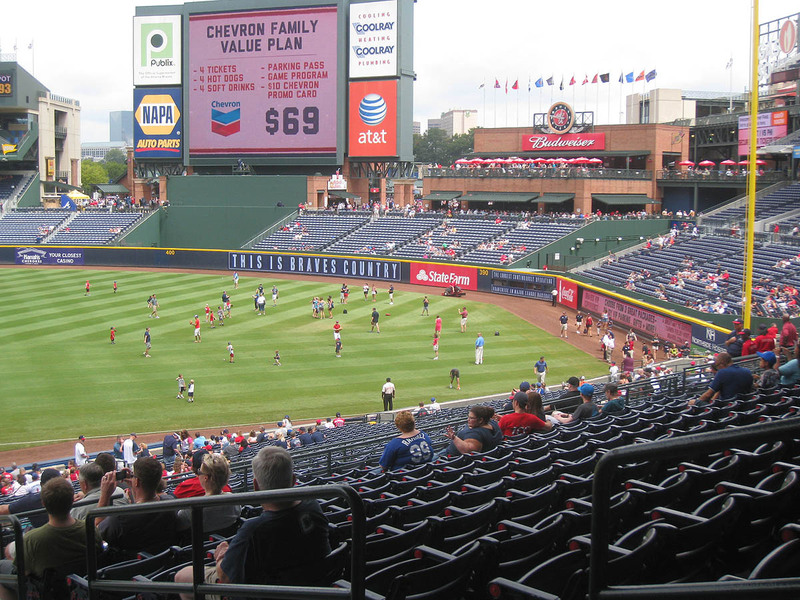 The female usher in left field is notoriously known for being a power hungry jerk. (or very good at what she has been told to do if you want to look at it that way) I somehow snuck past her and sat in the shade in a game earlier this summer. I witnessed her make at least 15 other people leave the section. There was only myself and about 10 others in the entire section. Again…I really enjoy reading your blog. I say you should have kissed the ball; given it wouldn’t have gotten cut off. 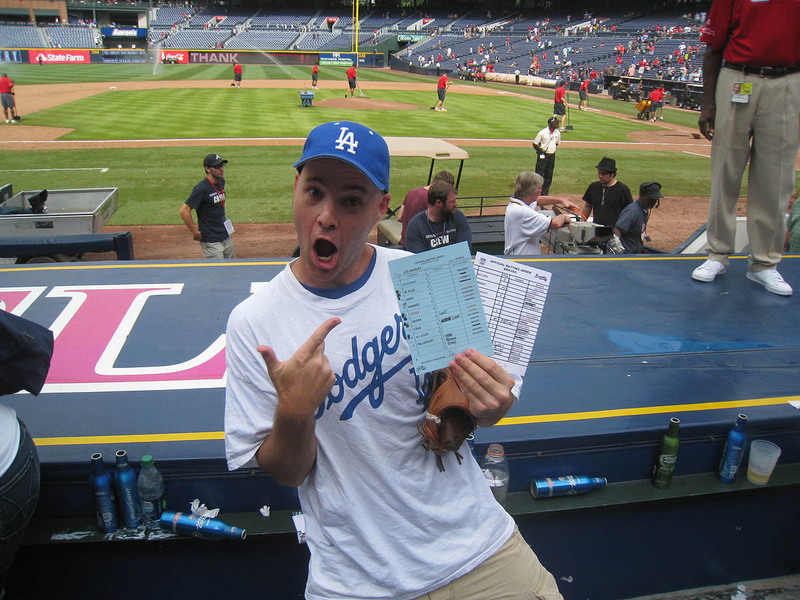 4 tickets, 4 hot dogs, 4 ‘soft drinks’ (booo…how bout beers, darn it?!? ), a parking pass, game program and a $10 Chevron promo card…all for $69!?!? THAT’S a GREAT deal! August 21, 2012 - 1:18 pm Ryan S.
Zack, That was awesome HIllman hooked you up. Nice class act. 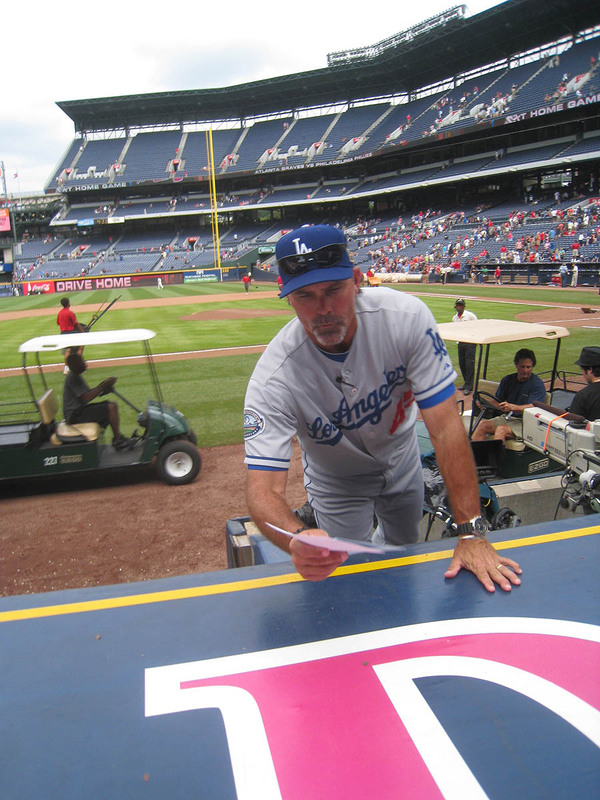 I find it interesting that Mattingly signed the lineup card as well, since he was suspended. Aren’t you glad you decided to go to the game?! Nice entry Zack. 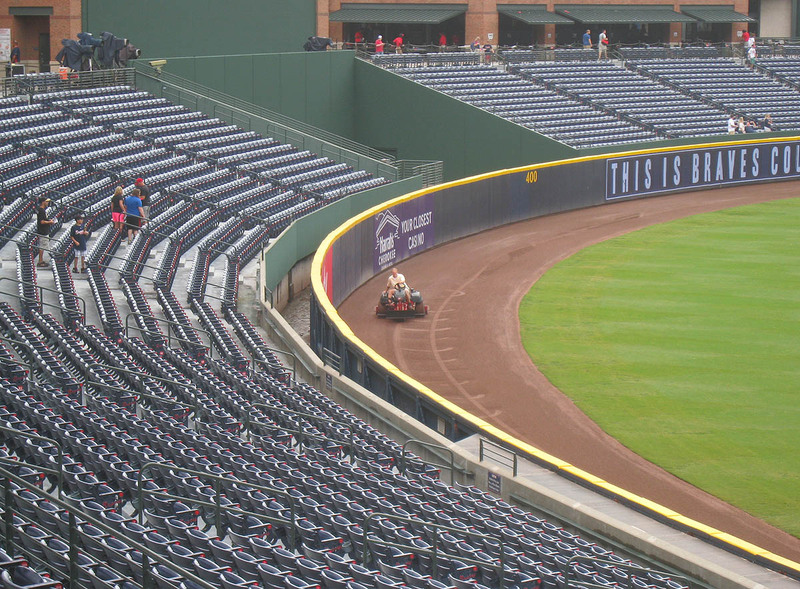 I’m curious how you were able to determine the first grouping of Braves batters to take BP, and still make it to the bleachers before they started hitting. It seems you were pretty far away at the time. Just superb vision, or is there another trick here? Also, I’ve noticed that you have a pretty good hold on the “single eyebrow arch”, which seems to be the one over-riding prerequisite for a career in Hollywood (watch for it). Just saying, should you ever decide to retire from ballhawking. I asked Bob Melvin for the line up cards after the A’s game yesterday, but he popped out and told me that he was going to recycle them so there was no point in my having them… Anyway…. I almost got kicked out of the Coliseum because the usher in my section behind the A’s dugout got mad at me when I tried to get 3rd out and infield warm-up balls. He would yell “LET THE KIDS HAVE A CHANCE!” I plan on buying new glasses that make me look like I am 6. Oh, and some guy asked me how many balls I have this year. When I told him that I had 9 Minor League and 16 Major League balls, on the year, he told me that some day I will trade the balls for a girlfriend. I told him that I have a girlfriend that loves all of my balls very much and he shut up for the rest of the night. Best Kiss Cam moment I’ve seen was at Camden Yards when one of the camaramen caught two Angels players sitting next to each other in the dugout watching the jumbotron…they were the last couple to be shown, haha. Seriously. And to think . . . I almost skipped the Sunday afternoon game last year when I ended up catching a home run by some guy named Trout. You know which one I’m talking about? She was all the way under the overhang at the top of the steps, like, if you walk 20 rows up from the cross-aisle. 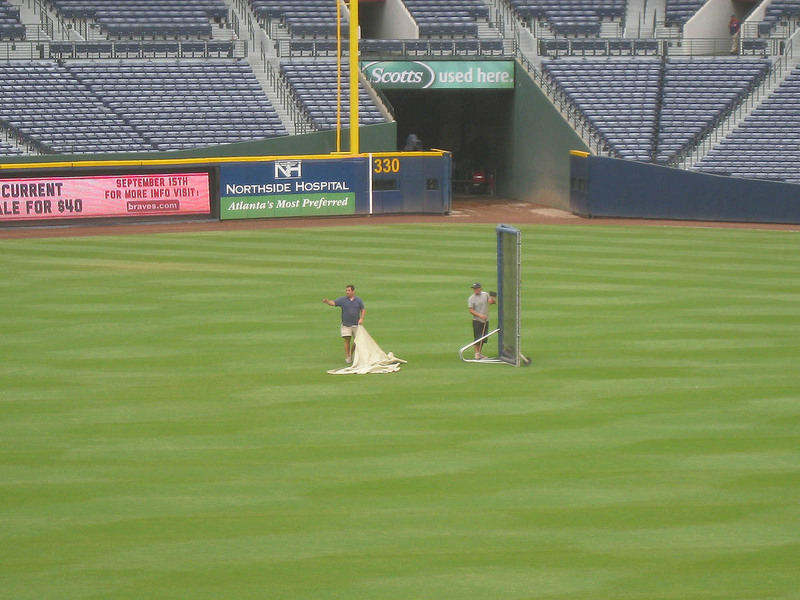 This was in foul territory, probably a bit closer to home plate than where the left fielder would normally play. Ha, I didn’t even notice that ’til you pointed it out. 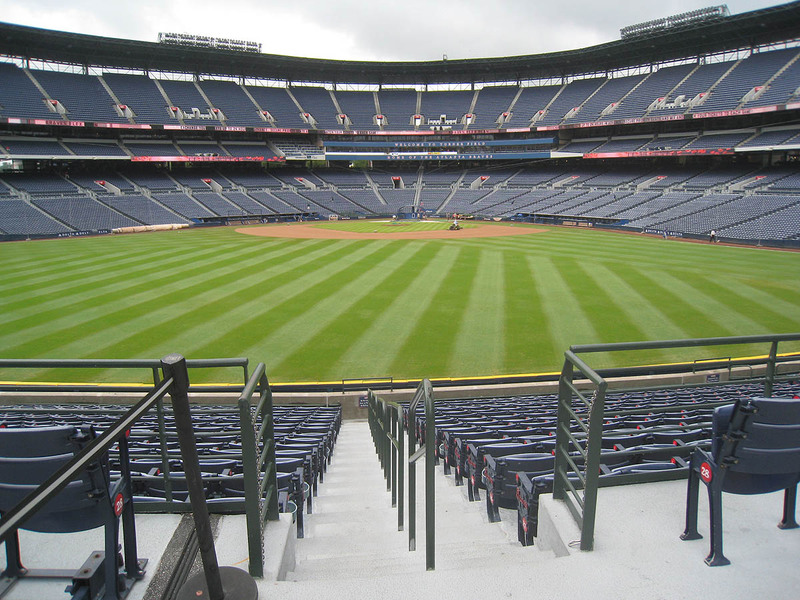 I was in left field when the Braves started hitting. As soon as I saw all those guys come up, I bolted to right field. Sorry if that wasn’t clear. That’s an awesome response, but still . . . be careful. It sounds like you’re having lots of run-ins with people. The same thing happened to me when I first started doing this. Eventually I learned to tone things down and share some baseballs, and it has made a huge difference. I’ve seen that done a few times at various stadiums. Fun stuff. You got cut off on the Kiss Cam because it took you an entire 5 seconds to realize what was happening lol. Glad you were able to link to the Tout video. It’s a cool service I think you could use during BP. I’ve seen Katie around the stadium before, so it’s cool y’all know each other. 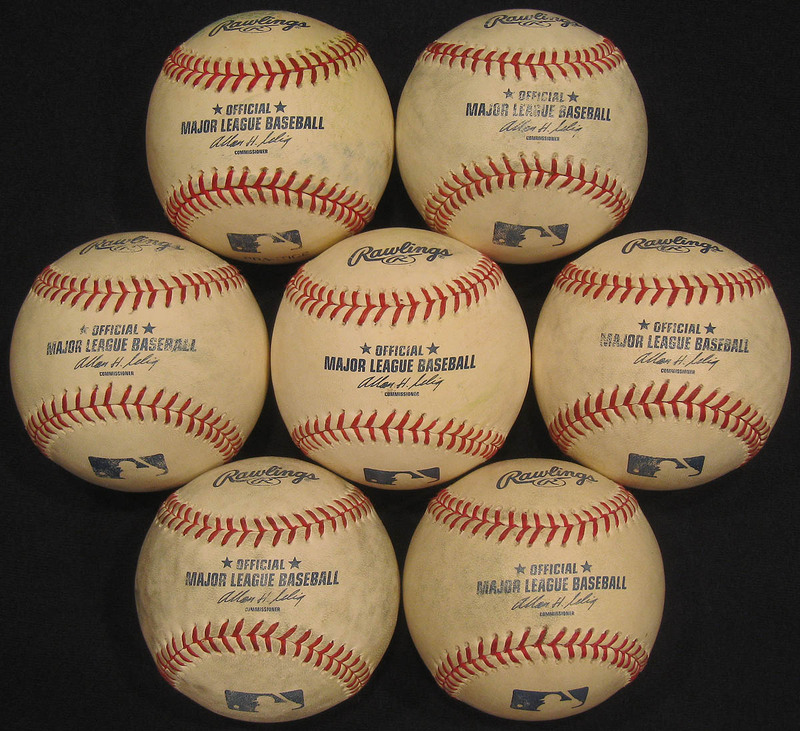 I gave away 2 balls at this game, and I am trying to give away more balls, I gave away my first ball in late July. And believe it or not, the guy who I had been talking to subscribed to my blog, and after I followed him on Twitter, he sent me a DM and apologized for what he said told me that I need to teach him how to snag balls. I then referred him to your website and blog. And regarding my encounters down the RF line, I talked to the security guard who had witnessed it all, and he told me that he wants more fans like me at A’s games. He told me other that the Chris Perez incident, his life would be boring without me. I would have picked option 2 as well. I know it doesn’t really count as I am ball hawking at minor league games but I am gunning for your record next year. I just snagged my 1,000th of the season last night and with the season winding down I am not going to break you 2011 record but next year I will!! Al- do you have an account at MyGameBalls.com Minors? If not, you should make one and enter your balls. The guy with the most balls has like 380 or something like that. Just noticed how crazy tired I look in that picture! Ugh. Very cool. You’re going to become the mayor of the Coliseum if you keep doing so many nice things for so many people. Go for it! You can set the minor league record (in case you don’t have it already). Ha, it does look like you’re collapsing on me.